Rick Gorczyca, owner of Bison Bluegrass works on a WNY lawn. It’s spring, which means it’s time to welcome Western New York’s annual home-building season. Once a house is built, the finishing touch is modern landscaping and a plush lawn. That’s when Rick Gorczyca, owner of Bison Bluegrass, often enters the picture. Gorczyca, who also works as a full-time firefighter for the Lackawanna Fire Department, opened his East Aurora-based company back in 1993. Consumers should begin to see results in just five to seven days, depending on soil temperature and moisture content. A new lawn should be ready to mow in three to four weeks, said Gorczyca. And while his company doesn’t do minor lawn repair, they do specialize in major repairs — such as the bare space left by the removal of a swimming pool or a yard that’s been torn up for septic tank installation, removal or repair. No matter the reason for the job, it is Gorczyca’s objective to give every customer a lawn that they can be proud of — whether it’s a brand new home, a commercial site or a repair — that’s backed by a commitment to customer service. 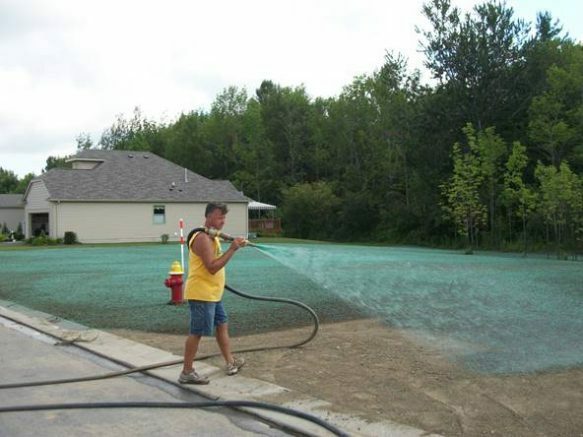 “I will be the operator at your job site to ensure that you receive the best lawn possible,” said the owner. “I take pride in my work and enjoy giving customers a lawn that they can be proud of for many years to come. For more information on Bison Bluegrass, please visit www.bisonbluegrass.com, call (716) 655-7333, email rick@bisonbluegrass.com or follow the company on Facebook for frequent updates. Be the first to comment on "Bison Bluegrass is setting WNY’s hydroseeding industry on fire"